In what appears to be the soup version of a soda with two straws, Panera Bread proudly announces the return of its Double Bread Bowl. Do you and your honey find that your separate crusty containers of broccoli-cheese soup just put you too far apart from each other? Fear not! Instead, snuggle up with this double-bowl platter that totally does not look like a dog food dish for a mere $9.99. Honestly, I would have a hard time eating ribs in front of my husband, or anyone, really. I can’t picture the two of us hunched over a table at Panera swapping spoons between two different types of soup as anything but hideous, and far from romantic. Likely most people are tidier eaters than I am, but still. 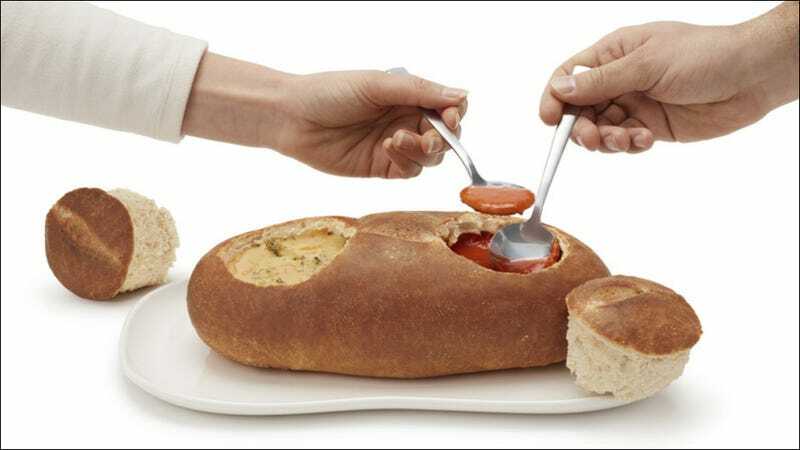 Also, it’s not clear from the press release if you can fill the double bread bowl with things other than soup. Apparently when the item was previously tested in Philly, mac-and-cheese was an option. Nothing like carbs in your carbs, although that might go nicely with the Creamy Tomato soup? (What if I just get a Double Bread Bowl just for myself? Don’t judge.) Happy Valentine’s Day everybody: May you all have someone special to share your Double Bread Bowl with.